Nurturing our planet's greatest resource...the minds and values of our children. Mountain Watch Press is the premiere publisher of motivational books for children, enabling parents, educators, and child care workers to inspire and educate children to lead healthy, active, and enthusiastic lives. Martha Gottlieb, CPT, CN has been motivating and inspiring friends, children, and those around her for over 30 years. An ACE-certified personal trainer and group exercise instructor, RYT 200 Yoga instructor, and certified nutritionist, she has an ongoing passion for nutrition and exercise science, and vigorously spreads her message of improved childhood health and nutrition to schools, parents groups, and anyone else who will listen. 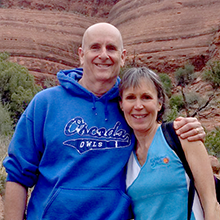 Jeff Gottlieb, CPT, an ACE-certified personal trainer, Level 2 Yoga instructor, and certified golf conditioning specialist, has been a writer for 30 years, having concentrated on film and television. He’s now turned his attention to co-writing the Spriggles Motivational Book Series as well as developing future Spriggles projects for film, television, and video. Alexander Gottlieb was an artist and illustrator for most of his 84 years and created the magical Spriggles illustrations at the ripe young age of 82. His work has been displayed in galleries throughout the country and he won numerous awards and ribbons from juried art shows in which he had been invited to exhibit. Jeff and Martha love reading Spriggles to children at schools and libraries, speaking at civic functions, and attending book signings. If you are interested in having them spread “spirit” and “giggles” at your school, click here. For all other appearance information, contact them at (888) 875-5856 or by email. Winner of an Educational Materials of the Year Award from the Michigan Governor's Council on Physical Fitness, Health, and Sports.